Weekender travel or overnight bag for the trendsetter traveler. Stylish stone washed grey with British tan accents and trim in poly-cotton fabric. Sturdy zipper. Over shoulder carry strap. Nicely sized for airplane carry on. Monogram ready. 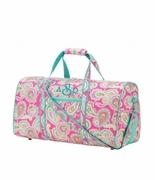 The weekender bag for woman measures 20"W x 10"H, 12" across the bottom. GREAT customer service. 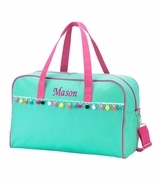 Bag is great quality and monograming is PERFECT. 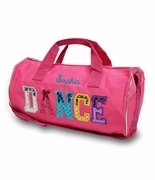 I ordered this bag for my daughter for Christmas. Received it within a week and it looks great. Very well made and super cute! I am a very satisfied customer!! I ordered a ladies overnight chevron bag for my daughter. When it arrived in the mail one of the initials was wrong so I called the customer service department and they were great and friendly to work with. I received a new bag a few days later which had the correct initials on it. I highly recommend this company for the quality of the bags and excellent service!